I talk non-stop about ING Direct, probably because they’ve saved me over $400 in bank fees since I signed up, and because I can access my money for free from banks in the Exchange Network (think credit unions, etc.) everywhere. Not only that, but banking online is fast and very easy to set up. And then there’s the famous Orange Key I’m always going on about. 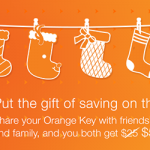 Normally, ING gives you a sweet $25 bonus to sign up with the Orange Key. From now until December 31, 2013, they’re giving you $50! Click the image for more info from ING Direct about this awesome promo! If you want to use my Orange Key to take advantage of some free money around the holiday season (through an account which will ultimately result in you saving loads and loads more money), the number is below. And if you do use it, my phone bill thanks you! You signing up with my Orange Key earns me $50 too, just as for every person who opens an account with your Key, you’ll earn $50! Ignore the part about $25, they still haven’t updated the widget to $50. Again, more info can be found about this promo here. Here’s to a money-filled season. What other ways will you save your money in the next couple of months? 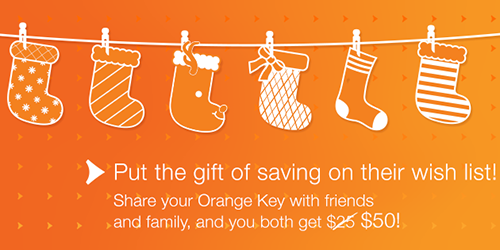 Share the post "ING Direct Canada is giving you $50 to sign up with an Orange Key! Time to do it!" « More like Hell-oween! AM I RIGHT? !